Two wasteful attacks and two relatively resilient defences could add up to a low-scoring affair here, although with the chaos surrounding Orient at the moment all bets are off. Both have created plenty of chances this season and it’s hardly a gruelling trip for the visitors, so regardless of the goal count this should be an entertaining match. Cambridge have finally gotten a few wins under their belt and their attack is looking less profligate, but with both victories coming against low-rated opponents it’s still too early to say whether the recovery is complete. 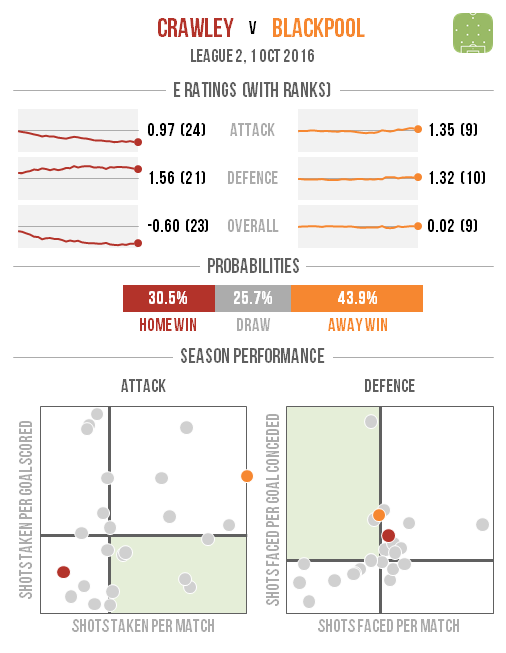 Accrington have sustained much of their impressive performance levels last season, with a slight shift in emphasis towards defence, and should provide a much sterner examination of Shaun Derry’s side. It will be interesting to see what happens at the home end here, with Colchester’s clinical attack meeting Carlisle’s resilient defence. The visitors will surely need to get on the scoresheet if they’re to take anything from this game, seeing as they’re up against one of the division’s most industrious forward lines. If the E Ratings are to be believed then Cheltenham are sitting deceptively low in the table at the moment. Their performance here, against a fast-improving Luton side, will tell us much about their potential to climb the table: the Hatters have been irrepressible up front and tough at the back, just as the Robins were in their promotion campaign last season. The quietest attack in the division hosts the busiest here, although Blackpool have lacked Crawley’s clinical touch in front of goal so far. However the home side look to have been riding their luck somewhat, with the lowest-rated attacking output and one of the shakiest-looking defences, so the visit of such industrious opponents could see them overwhelmed. Despite creating a similar number of chances this season, these two sides have fared very differently in front of goal. 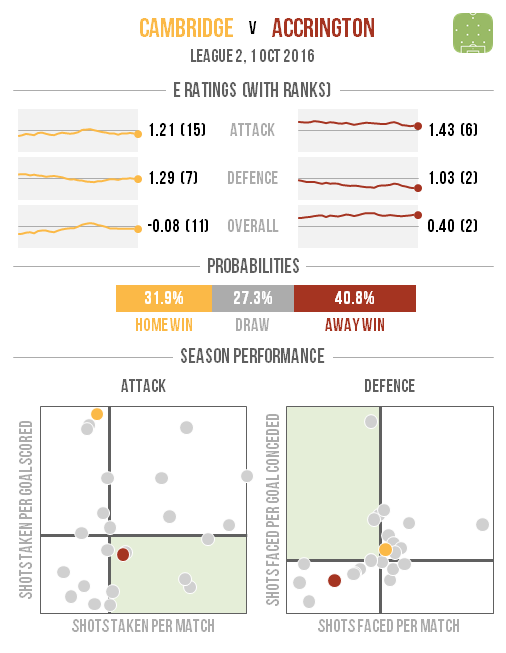 Crewe have been among the sharpest finishers in the fourth tier while Mansfield have struggled to force the ball over the line, although they’ve been far more effective at denying their opponents opportunities. It’s therefore likely that the home side will need to display further ruthlessness in front of goal to avoid a stalemate here. 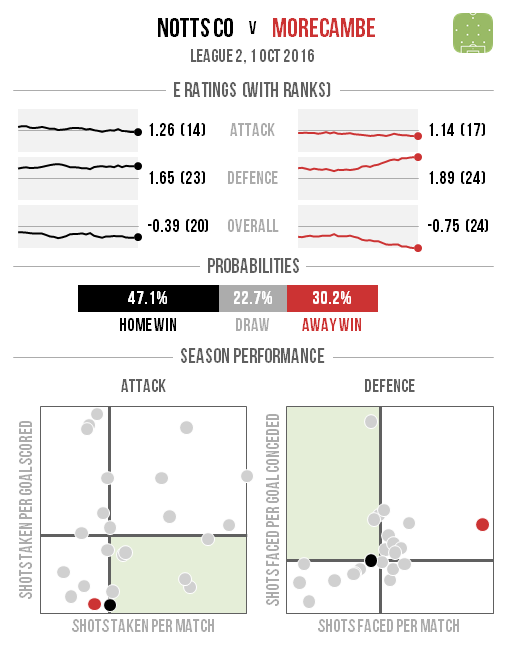 While Grimsby have created plenty of chances this season their defence is looking far less solid than last season, even accounting for the jump in standard of opponent (which the E Ratings automatically factor in). 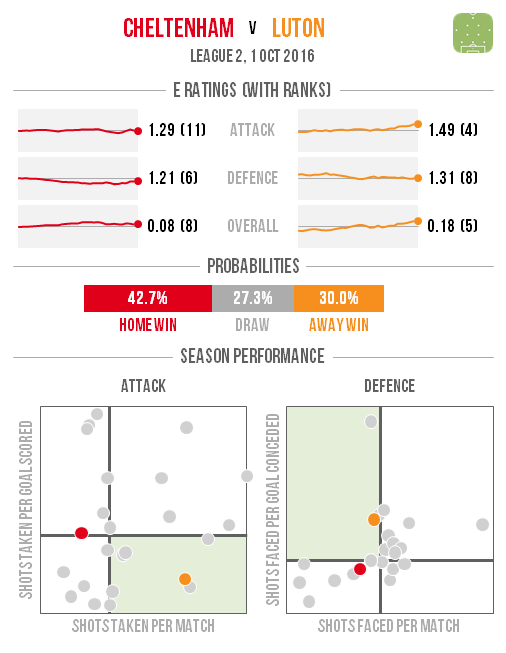 They have an opportunity to bolster their defensive rating here against one of the division’s quietest attacks, although Hartlepool look to be making modest improvements up front and have been ruthless with the chances they have carved out. Newly-managerless Newport have looked shaky for a while but Stevenage haven’t been convincing either. 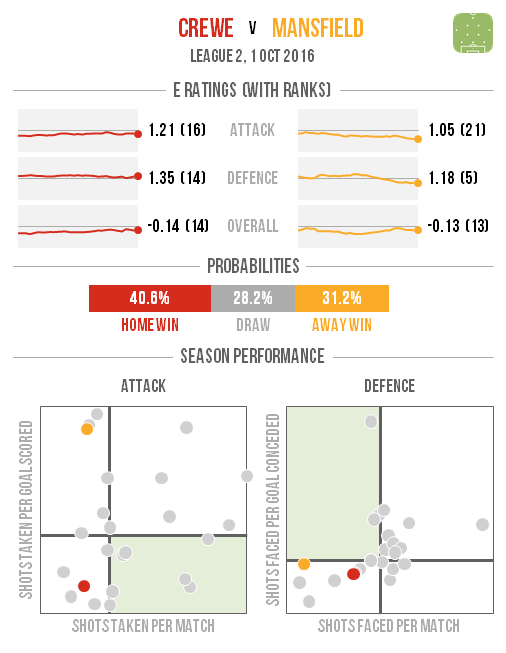 While the visitors’ attack looks clinical their 6-1 win over Hartlepool is skewing the picture somewhat, although there have been genuine improvements in defence since last season which give them a decent chance here. 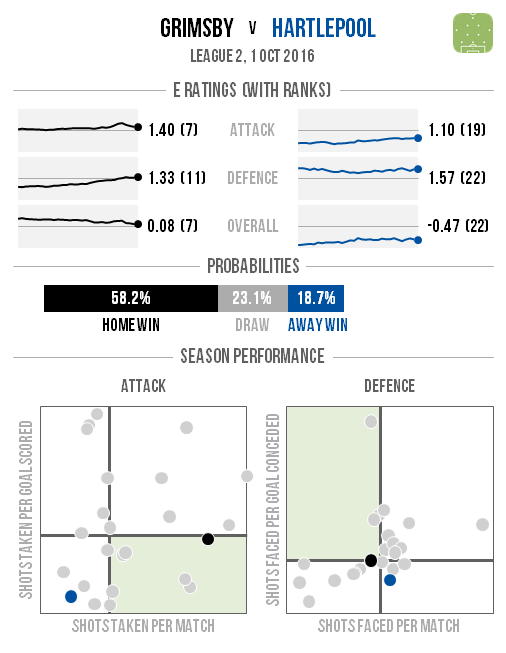 Two of the division’s most clinical attacks meet here which, with both sporting poorly-rated defences, seems to promise goals if they can keep that form going. Morecambe’s defence has allowed far more shots than anyone else, with a significant deterioration from last season making them the worst-rated side overall, although Notts County haven’t fared much better. Just as they did last season, Plymouth have stormed to the top of the table thanks to an obscenely robust defence. 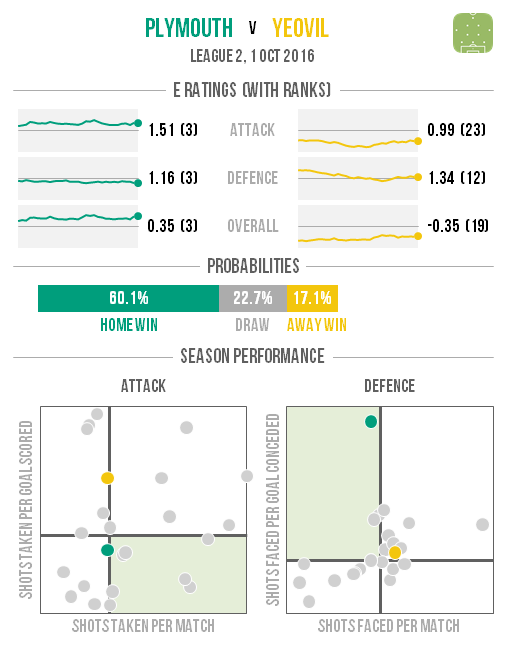 Visitors Yeovil – in probably the only time they’ll need to be shown in their away colours here this season – have long struggled up front and this season looks to be no exception, so despite some recent defensive improvements they aren’t likely to prevail here. 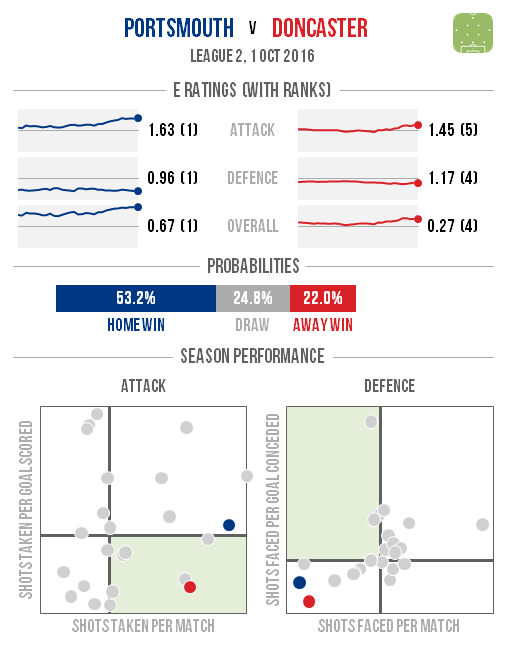 Doncaster looked strong against Carlisle, which bodes well for another encounter with a promotion rival. 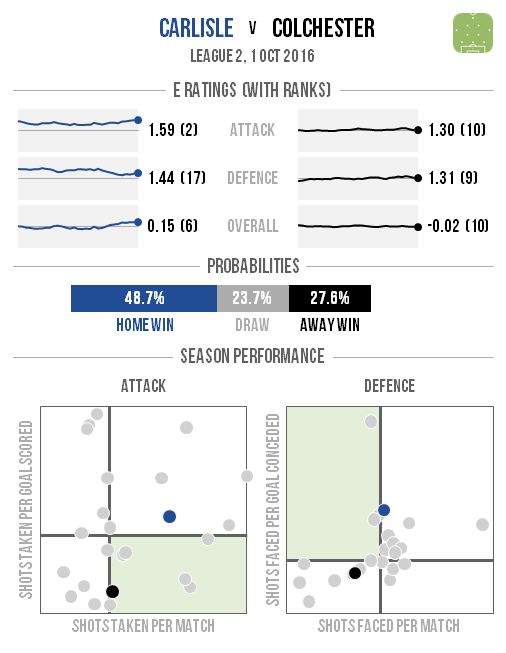 Portsmouth are the division’s best-ranked side by quite some distance and – their recent hiccup at Blackpool aside – will take some beating here. The visitors have enjoyed better fortunes in front of goal so far but have also fared more poorly at the back, which could prove their undoing. 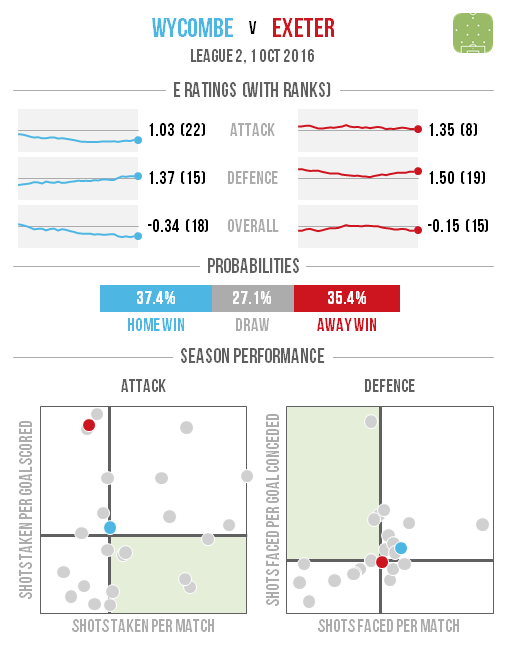 Their 5-1 win in midweek means that Wycombe are no longer Exeter’s neighbours in the wasteful zone of the attacking scatter graphic, but concerns about their attacking performances remain. 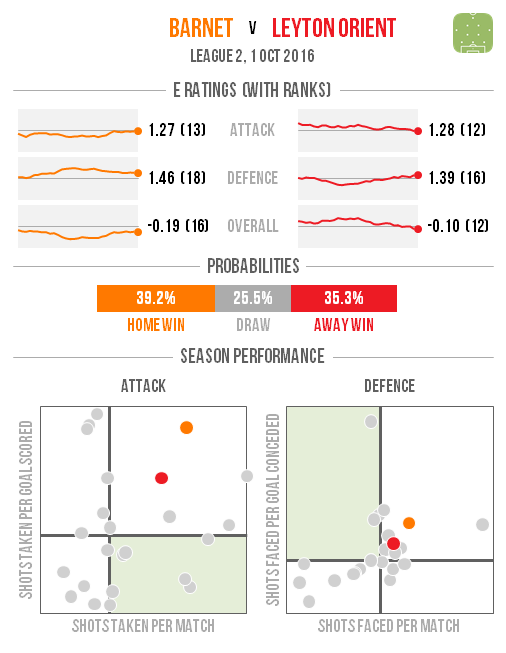 However their visitors’ defence has been their main weakness this season – the quality of their finishing notwithstanding – which gives the Chairboys the opportunity to pull further away from the danger zone.